Mad About Meghan: It's Givenchy & Earrings from The Queen as Meghan Joins Her Majesty in Chester! 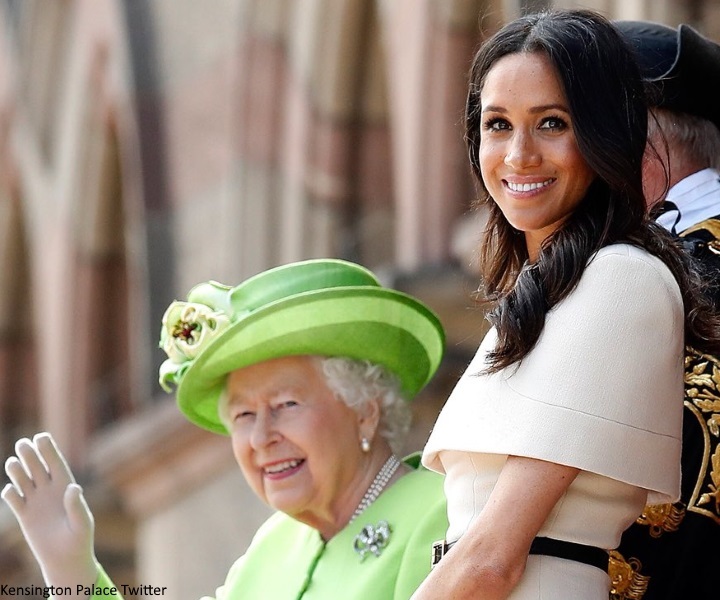 It's Givenchy & Earrings from The Queen as Meghan Joins Her Majesty in Chester! 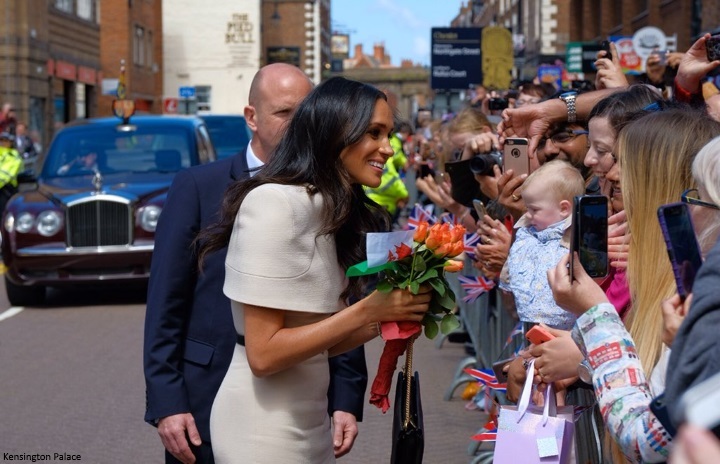 A day of excitement and anticipation in Chester as the Duchess of Sussex accompanied The Queen for several engagements in the city. Her Majesty and the Duchess arrived at Runcorn railway station this morning following an overnight trip on the Royal Train. The nine-carriage Royal Train has been used since 1842. In fact, yesterday marked exactly 176 years since Queen Victoria became the first British monarch to travel by train, making the inaugural royal train journey, Slough to Paddington. The current rolling stock dates from 1977-1987. It is used about 14 times annually by the Queen, the Duke of Edinburgh, Prince Charles and the Duchess of Cornwall. It is the Queen's preferred mode of transport. She finds it much more comfortable to travel overnight on the train rather than departing in the early hours by car or helicopter. It was a unique opportunity for the Queen to spend time with her new granddaughter-in-law. I'm sure a nightcap was enjoyed during their chat - a glass of red for Meghan and perhaps a Dubonnet for Her Majesty. The two shared breakfast together this morning, which I imagine involved going over today's itinerary. Below, a peek inside the Royal Train from images taken in 2010. 'Her Majesty's personal saloon is 75ft long and fitted with secondary air suspension giving passengers an exceptionally smooth and comfortable ride. It has a bedroom, decorated in light pastel shades, with a 3ft-wide single bed in one corner (there are no double beds on the Royal Train) made up with cotton sheets and woollen blankets. While Prince Philip's pillows are plain, the Queen's are trimmed with lace, with a small Royal cipher in one corner. The ceiling has subdued strip lighting and there are several reading lamps near the bed. The adjoining bathroom has a full-size bath, but the fittings are modest and functional. 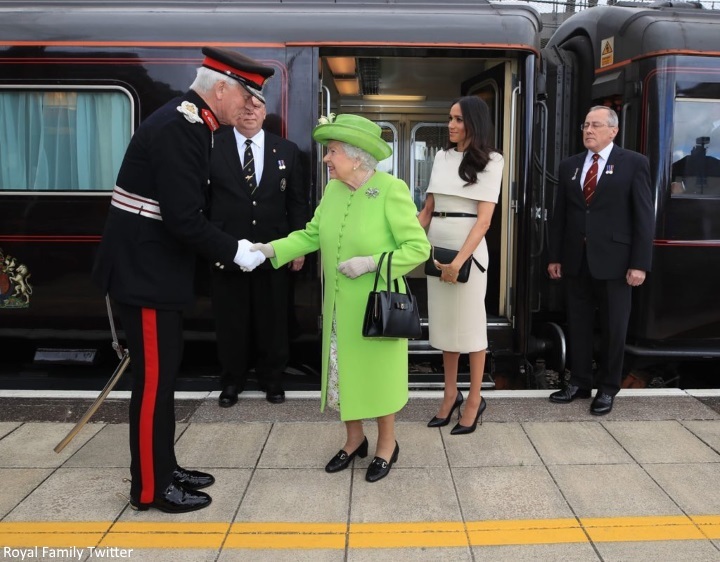 The train operators make sure the carriages are not crossing any bumpy points just after 7.30am: that could make the water slop around when the Queen is taking her bath. The train's speed is always lower than the normal maximum for any route. “I’m very happy to be here,” Meghan told the Lord Lieutenant of Cheshire, David Briggs. It was an incredible honour for the Duchess to join the Queen; it not only marks her first engagement with the monarch, but also her first day of duty without Prince Harry by her side. It's less than a month since the couple married at St George's Chapel. Meghan has spent quite a bit of time with the Queen during meetings and lunches at Buckingham Palace and Windsor, the two are said to be very fond of each other. As Meghan embarks on a lifetime of duty and service, there is quite simply no one better suited to advising and guiding her than Her Majesty. Meghan meeting architects, planners and community representatives. A video from the performance. 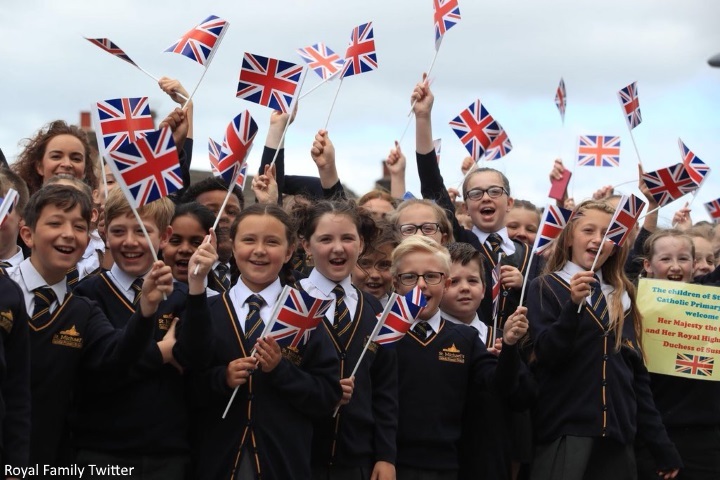 Local schoolchildren greeted the royals. The Mersey Gateway is a multimillion-pound transport scheme between Runcorn and Widnes in Cheshire. The main part of the project was the construction of the "Mersey Gateway" toll bridge spanning the River Mersey and the Manchester Ship Canal. The crossing, which opened in October 2017, has three traffic lanes in each direction. The project has created 4,640 permanent jobs in the area and provided 73 weeks of work experience for local students during construction. The Queen unveiled a plaque officially opening the bridge. Of course, today marks the one year anniversary of the horrific Grenfell fire which saw 72 people tragically lose their lives. At precisely noon, a siren marked the beginning of a 72 second silence. The silence was marked at UK government buildings across the country. The Queen met Grenfell Tower residents in the days after the fire with Prince William. Earlier this year, Meghan made several private visits, meeting families comforting those who lost loved ones in the blaze. A leading Grenfell community member told the Mirror: "Meghan’s visits mean so much to us. She has a special place in our hearts." 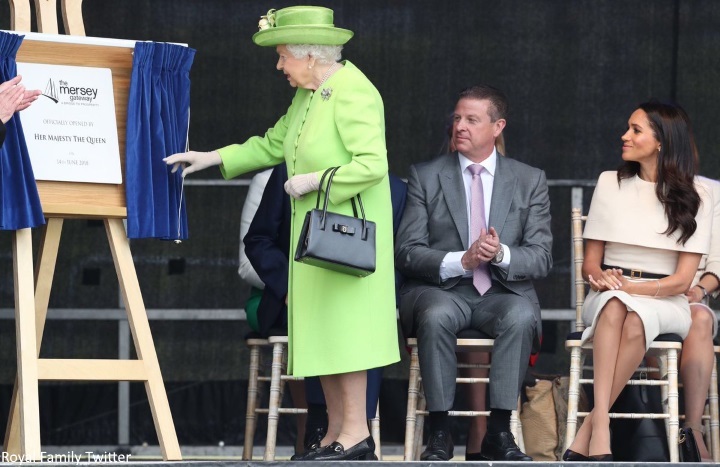 The green hue of the Queen's Stuart Parvin outfit was a thoughtful nod to Grenfell. 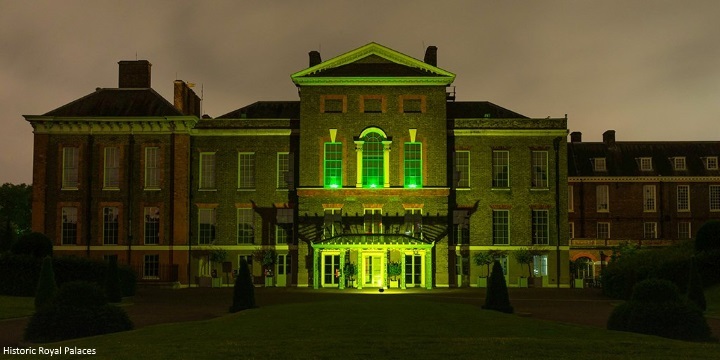 Kensington Palace was illuminated green last night as a mark of respect for the victims of the fire. Huge crowds turned out in Chester. 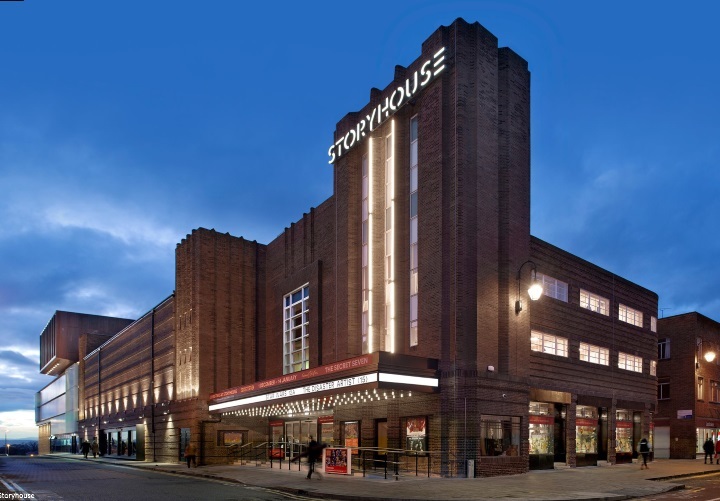 Their next port of call was Storyhouse - a library, theatre and cinema. It is one of the country’s most successful cultural buildings, with one million customers in its first year. 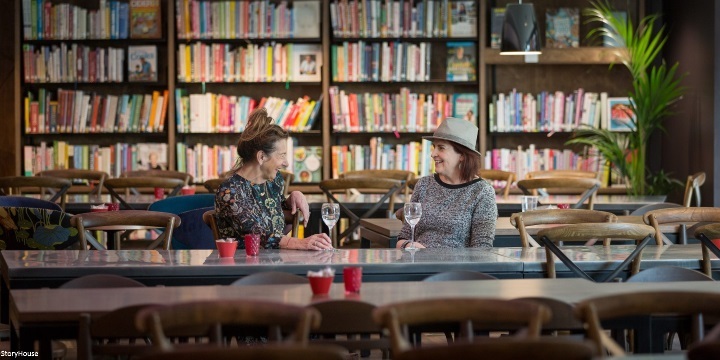 The pioneering new library within Storyhouse, where members of the community work alongside city librarians, boasts the longest opening hours of any UK public library. 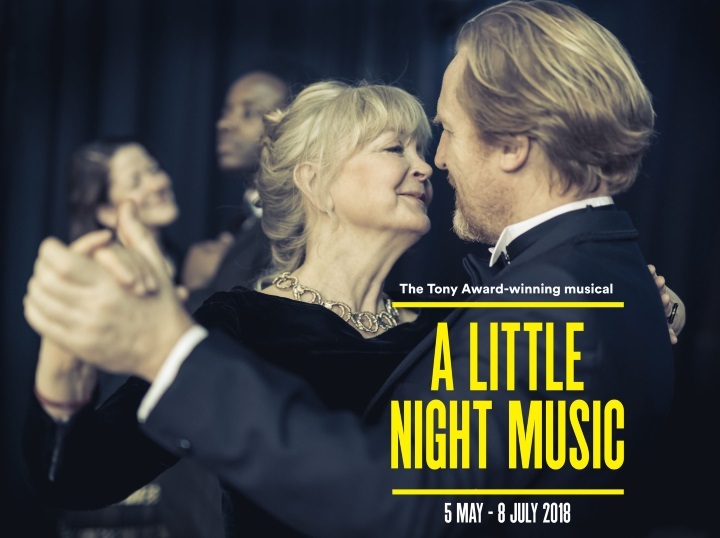 The company also runs a highly successful theatre company which has gained national acclaim for its new stage adaptations, including the first ever version of Enid Blyton’s The Secret Seven. Storyhouse also runs the country’s most successful regional open-air theatre company, in the city’s main park. Storyhouse offers over 2,000 activities each year for local marginalised groups, including autism friendly colouring sessions, sewing groups for refugees and regular classes for isolated and older communities. Events on the agenda currently include an evening with Nigella Lawson, Summer Holiday, the musical and a showing of Thelma and Louise. In the age of Kindle and electronic reading devices, we've seen libraries across the country closing their doors. The concept of Storyhouse is a genius one. Not only is it a one-stop shop for the library, cinema and a whole host of activities, it recognises and fosters the importance of a social outlet and focuses on community inclusion for the elderly and those living in in isolated circumstances. It's the perfect itinerary for a royal visit; celebrating the success of a city and those involved in improving their area, we've seen two examples of this today with the Mersey Gateway and Storyhouse. It's very much about the royals bearing a spotlight on the community and meeting as many people as possible. 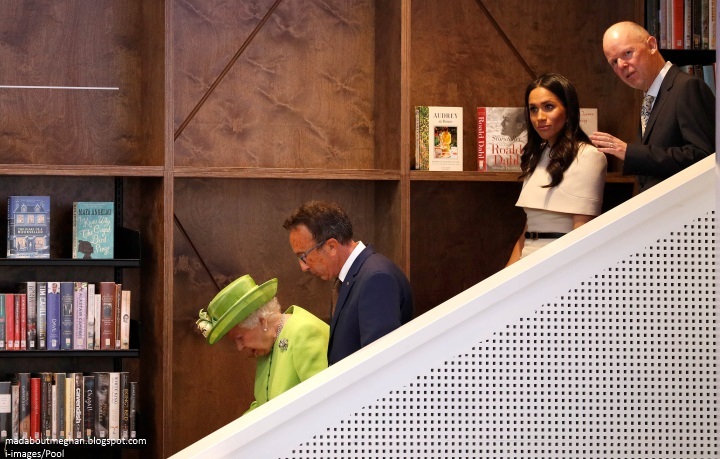 The Queen and Meghan enjoyed a tour of the building to visit the children’s library. They met with a group of 'digital buddies'. 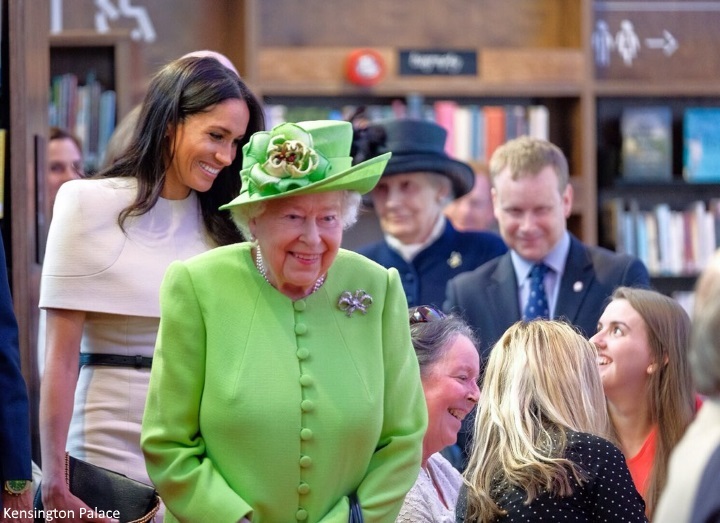 'On their way to their second performance of the day, the Queen and the duchess stopped off to speak to a group of ‘digital buddies’, a group of young volunteers helping elder members of the local community get to grips with technology in the library area. Frank Samuel - a ‘reluctant over 50’ - told her he was keen to learn about computing as he didn’t want to get left behind. ‘Everything uses these things nowadays, ‘ he said to her, waving to his computer. 'Yes even the bridge I was just at,' laughed the Queen, referring to the toll bridge she had opened. ‘She had a bit of a giggle about that,’ said Mr Samuel. 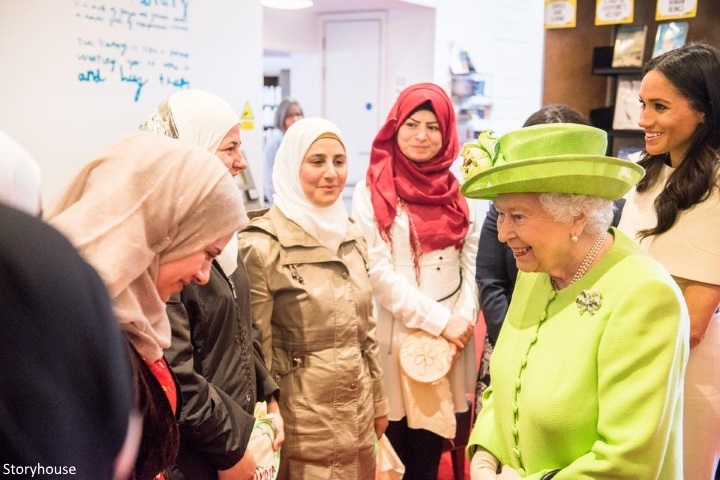 The Queen and the Duchess met a Syrian settlement group engaged in craft work. 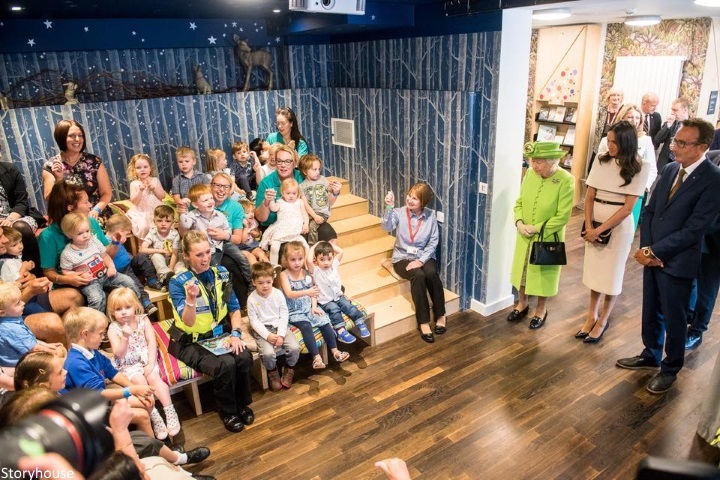 The royals stopped in on a storytelling session for local nursery children. Improv Gym is a weekly drama workshop for the over-50s. They performed a short series of improvisations during the visit. They watched a performance by ‘Fallen Angels’, a dance theatre company for people in recovery from addiction. 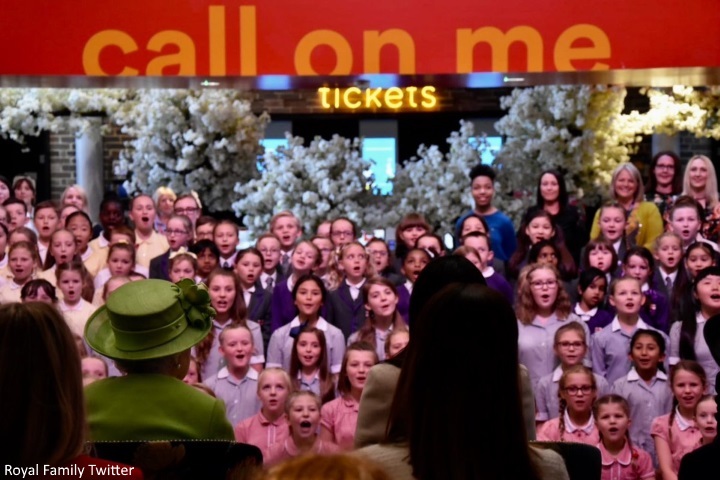 At the theatre they saw a medley of songs from Storyhouse’s latest production, ‘A Little Night Music.’ Samantha Cohen sat behind Meghan, the Queen’s former Assistant Private Secretary, will be working closely with Harry and Meghan for the next six months. Amy Pickerell, who has been assisting the Duchess since the engagement was beside Ms Cohen. Inspired by the Ingmar Bergman film Smiles of a Summer Night, it involves the romantic lives of several couples. 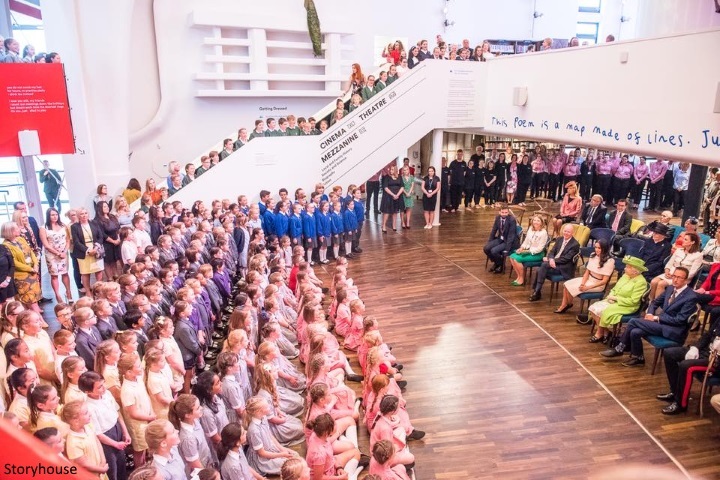 Local primary school children performed songs alongside actors from ‘Swallows and Amazons.’ It was very fitting for former actress Meghan to join Her Majesty opening a theatre. A choir of over 300 primary school aged children, from 11 schools across Cheshire West and Chester performed the song: Drop in the Ocean. 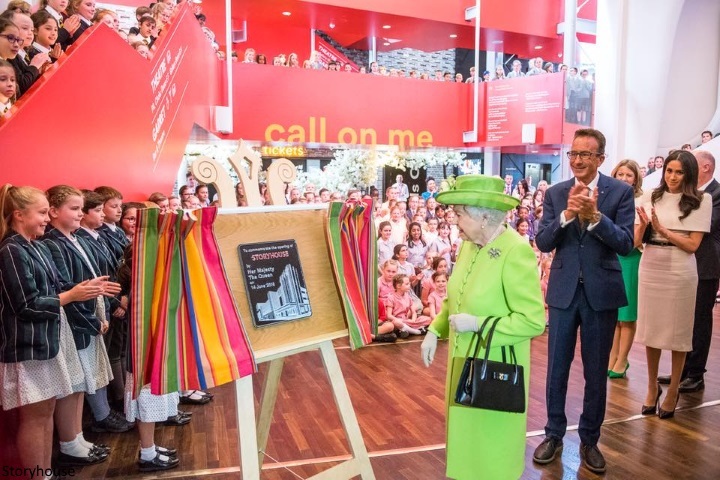 Her Majesty unveiled a plaque to mark the official opening of Storyhouse. Meghan met locals during a walkabout. Apparently she told a lady Harry is "the best husband ever". 'The ecstatic newlywed royal, 36, told well-wishers she was “really enjoying” married life as she met locals in Chester alongside Queen Elizabeth for a series of events. 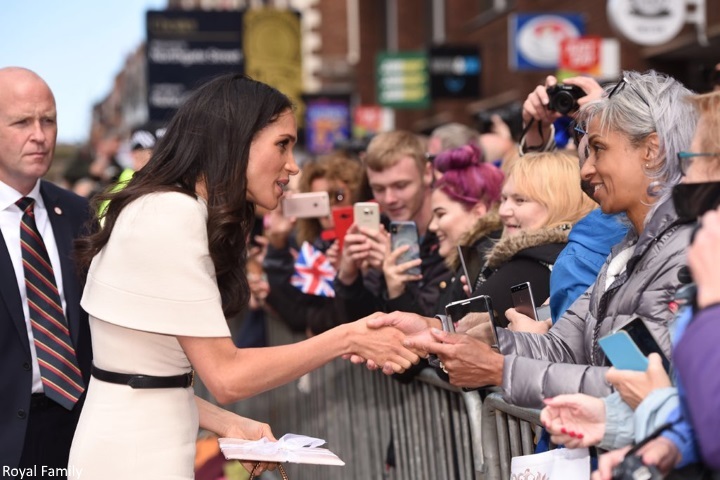 Sharon Briscoe, 61, who had traveled about 25 miles east from Chirk, Wales, for the chance to meet Meghan asked her how she was enjoying her new life. The Duchess was given beautiful flowers. 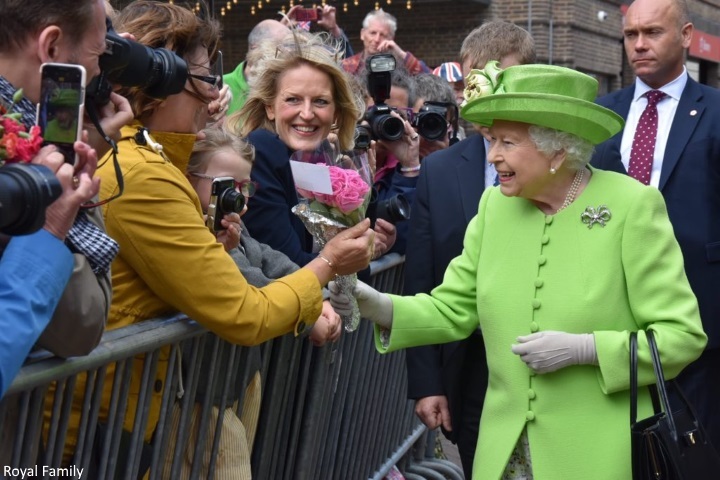 Her Majesty greets members of the public. The Duchess was in her element mingling with the crowds. Lilja and Nye gave the Queen and Meghan gorgeous posies. 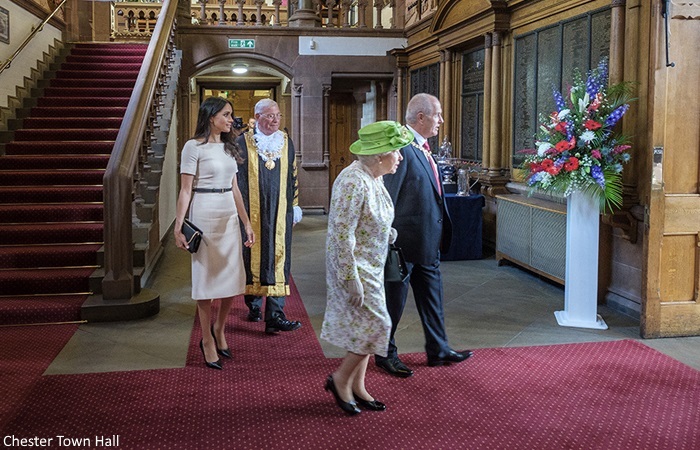 Finally, The Queen and The Duchess walked to Chester Town Hall where they attended a luncheon as guests of Chester City Council. 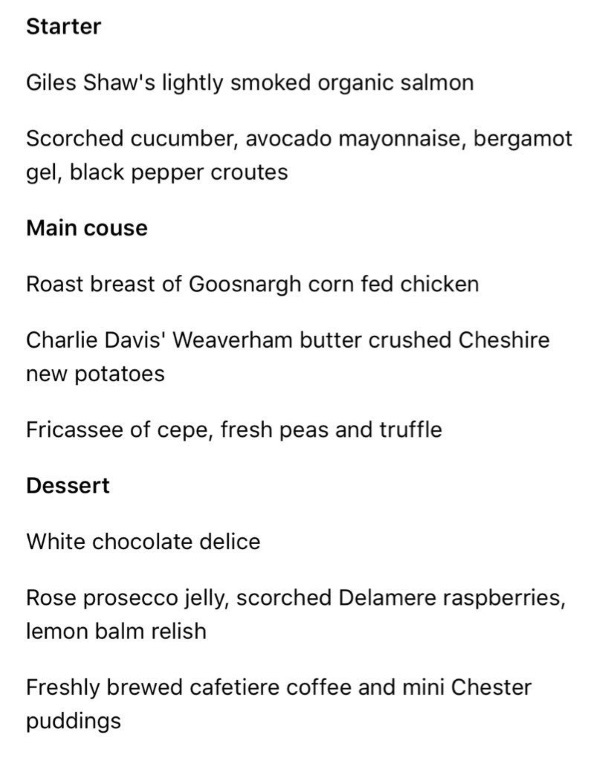 Omid Scobie shared the menu. Listen to the cheers at the end of this video. 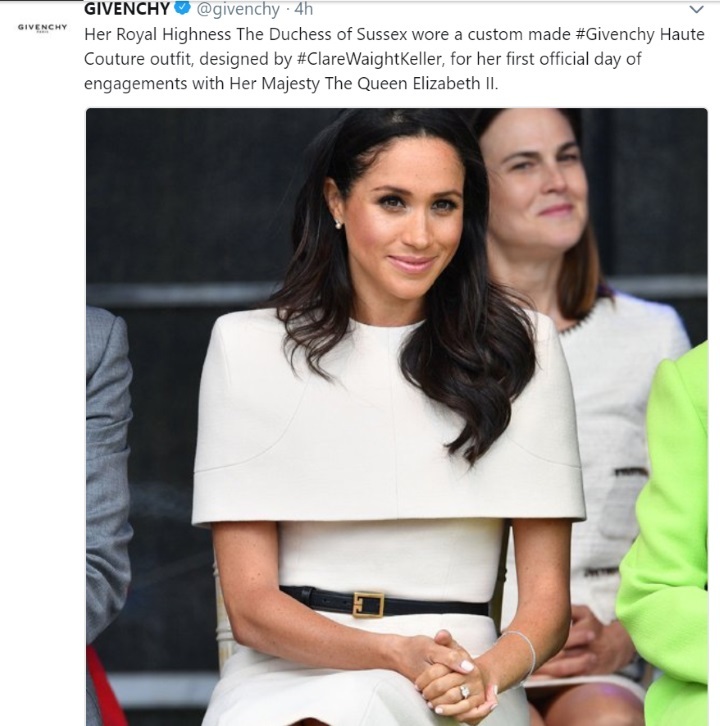 Meghan wore a bespoke cream cape dress by Givenchy. Meghan and Clare Waight Keller formed a close working relationship during the design and creation of Meghan's timeless wedding gown. It was important to the Duchess to highlight a leading British designer and she chose Waight Keller for her "elegant aesthetic, impeccable tailoring, and relaxed demeanour." Given the nature of events Meghan will be attending in the coming months and years, the designer is the perfect choice when it comes to stylish custom pieces which will be appropriate for royal outings like today. The entire look was beautifully tailored, professional and understated. This image from Chester Town Hall offers a look at the dress sans capelet. 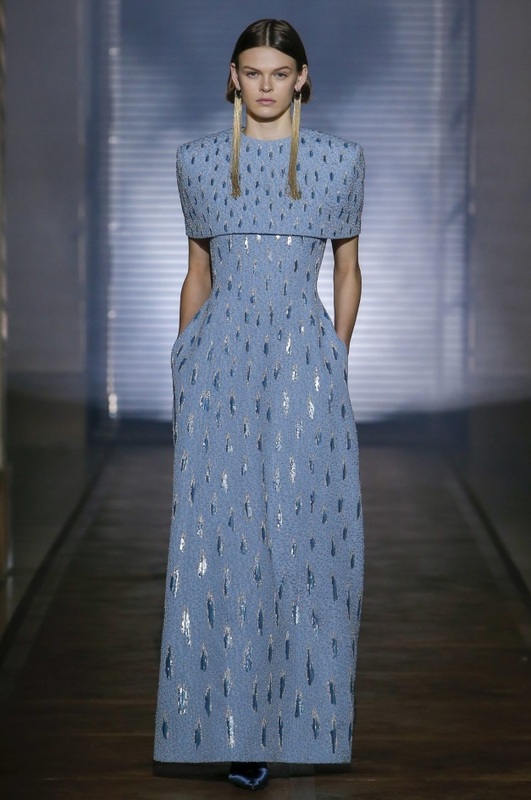 This gown from the Spring 2018 Collection features a similar neckline. 'The last time we saw the Duchess of Sussex wearing Clare Waight-Keller for Givenchy it was for a very special reason - her wedding day. And now, Meghan has called up her wedding dress designer to dress her for another royal milestone - a visit to Cheshire on her first solo outing with the Queen. Wearing a cream caped dress by Givenchy, the Duchess of Sussex looked incredible as she stepped out with the monarch. Meghan's belt is the Givenchy Black 2G Buckle Belt. Made in Italy, it retails for $450. 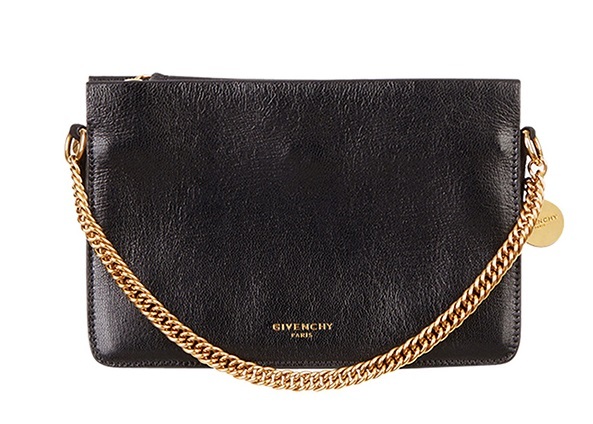 Meghan's Fashion identified Meghan's bag as the Givenchy Leather Crossbody Bag. Meghan wore the Sarah Flint Perfect Pumps. 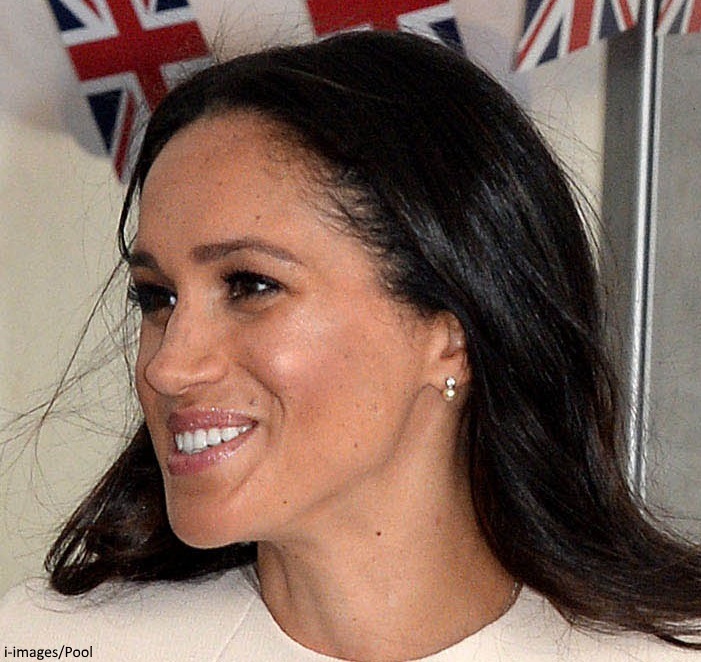 Buckingham Palace confirmed Meghan's new pearl earrings were a gift from the Queen. In fact, they appear to match the pair Her Majesty wore today. Emily Nash believes they are from Her Majesty's personal collection. A lovely gesture! And a closer look at Meghan's silver bracelet. The visit features prominently on tomorrow's front pages. In others news, Kensington Palace confirmed the Duke and Duchess of Sussex will undertake a tour of Australia, New Zealand, Fiji and Tonga in October. We can expect to hear more details closer to the date. Royal Ascot begins next Tuesday, it's likely we'll see Harry and Meghan at some point. Lovely dress but no hat? Surely she got the memo. A hat isn't essential for today's 'dress code' as it's day engagements in the city. For example, do you remember when the Queen, Camilla and Kate visited Fortnum's? HM was the only one wearing a hat. But other than Fortnum's when Kate went with the Queen on engagements (Leicester, East Midlands, London underground) and the Queen wore a hat, so did Kate. So how is it decided if a hat is necessary? Sophie and Camilla have attended several events where HM wore a hat and they did not. Certainly, Meghan was informed before today. I'm not sure how it's decided, I imagine, it's based on the itinerary? The on going hat issue is so exhausting. Surely, there was no memo. It was her choice and she did what pleased her. We don't wear hats here in the US, generally speaking. This is something that likely requires some getting used to on Meghan's part. So if the event does not require one, then I completely understand if she chooses not to wear one. She's probably much more comfortable without it. I know I would be. I've often thought that the Queen's hats on such visits stand in for a crown. You'll notice that her hats are usually some variation of a columnar shape with smaller brims than Camilla's. These serve to frame her face, and, as she is petite the hats add some height to make her more visible to the crowds. It would be interesting to know why (or why not) other senior royals accompanying the Queen do not wear hats most of the time. However, I'm with those who prefer not to make a big deal of it or suggest that it's some sort of gaffe on Meghan's part. If a hat had been necessary/mandatory she would have worn one as she has on all other occasions where one is required. On the whole, this is a lovely ensemble on Meghan. While it's creamy and nondescript enough to "blend" into the background it is distinctive for both its couture and the simple caped detailing. I hadn't noticed Meghan was not wearing a hat and that the Queen was until this was pointed out. I imagine HM is aware it is not an American custom to wear a hat . I think acceptance of Meghan's American ways is probably important to HM and certainly good for PR these days when GB will be looking to maintain ties, not alienate them. Something that occurred to me awhile back--I wonder if the Queen will ask M&H to be a part of greeting President Trump this summer. July, wasn't it? The Fortnum appearance was inside. Unless HM has been traveling, I don't think she generally wears a hat indoors. I don't believe HM wears a hat to the garden show either. I do know she does not wear one when she has an event at home, including the Royal Mews where she appeared hatless with Camilla for a recent engagement. I think some of these attire customs are from decades or more ago and were carried on to the present as a tradition by the Queen. Everybody wore a hat in the forties. I wore a hat and white gloves to church as a teen in the fifties and my Dad always wore a hat when going outside the home. I think hat wearing is a lovely custom in theory but I imagine it can also become rather bothersome in practice. Just a guess, but perhaps other royals do not wear hats so that the Queen stands out - she is vertically challenged (LOL), and hats give her height. If other women wore hats, she would not be as visible but lost in the sea of chapeau. & would the plural be "chapeaux"?? Love that dress. She looks stunning. I guess touching her hair means she is very nervous? I know I do it, when I'm very nervous. I cannot wait for more pictures. Based on the video Charlotte posted, it's very windy. A good day for an updo, me thinks. And I'm not a cape fan, but the dress is appropriate and Meghan looks good. That's what I thought, too, Anjolie. I know she's a very confident person, but I would be nervous on my first outing with the Queen! It was super windy, but I couldn't help but think she was fidgeting more due to nerves. I love Meghan’s dress! 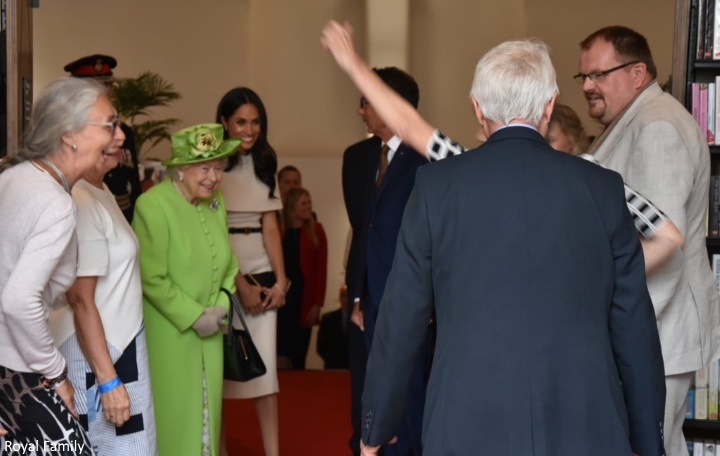 Am I the only one who thinks it looked like Queen Elizabeth seemed to reach back and wave a hand like she was saying to Meghan, “step forward for greetings”? I noticed that,too. Such a sweet gesture. I LOVE this dress. It's divine! Sure a nice cut, the covered shoulders make it very modest. But I imagine Givenchy will be given a notice to pick cloth more carefully next time, the dress is creased after the first car ride. I would have also imagined Meghan to have the hair in an updo to avoid "outdoor" issues (which add to nerves...). One thing I noticed - unrelated to Meghan - every lady always wears very high heels next to HM. Wouldn't it be nicer to go for ballarinas, out of respect for the height difference? What do you think? No. As someone who is only 5 foot, a two inch heel verses a 5 inch heel is really irrelevant. Meghan will be taller than the Queen regardless. Maybe it’s just me, but if someone who is already taller than me decided to wear flats so they wouldn’t be as tall ends up being condescending. No need to make yourself smaller to try and make me feel more important. Love the dress. It kind of looks like its Meghan's preferred off the shoulder style, while actually being entirely appropriate for a day of engagements with the Queen. How far is Chester from london on the train? It surprised me that they would travel overnight. Steph it Is 266 kms or 165 miles from London to Chester. Most sites say it is a 4.5 hour drive by car...likely quicker by train. Since there were morning engagements, they would have had to leave London very early, if they did not do an overnight. While the outfit is undoubtedly appropriate for such an occasion, it seems to me that Meghan is not being herself. I fully understand that protocol dictates a "parameterized" code of dress; however, an accessory that makes the outfit more "Meghan" (e.g. a small purse rather than a clutch, hair that better represents her taste, non-court style shoes, etc,...) would have been nice. Not sure what you mean by more "Meghan." If you look back on pictures of her pre-Harry, this is exactly the way she wore her hair and there were many a red carpet appearance with court shoes. I think this look does represent her taste. Without the cape she dresses like that in "suits" as Rachel zain and it suits her body shape and is well fitted for once. Well said, BethNY. I am so taken with the term "court shoe". I assume this is a simple pump as we say in the USA. The bag is her usual style, a crossbody, she just removed the straps for this outing. 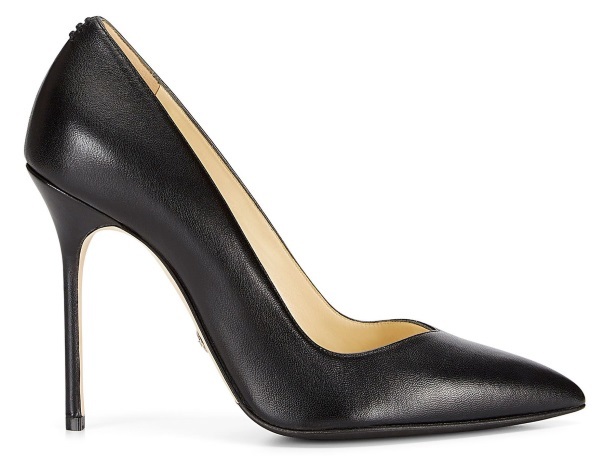 The heel is a bit too high and narrow for me to refer to it as a standard court shoe and mostly I'm just happy that they're leather instead of suede (I dislike suede in the summer). I actually think this is quite Meghan. It's not a coat dress and the simple black pump perfectly compliments the dress. We also get a touch of Meghan fashion with the shoulder cape. I think she did an excellent job blending protocol with her own personal taste today. And, as others have said, this look is very similar to what she wore on Suits, too. I agree Becca, it’s a new stage in her life, a new job and new role ( excuse the pun). It’s a new work look just we will see more relaxed looks as before. I think she probably created this look and maybe even a few more in consultation with Givenchy while the wedding dress was being created. This could be another partnership like McQueen and Catherine I guess. The best of MM is arriving. It is complete, delightfully neutral and looks good on her. Talk about shoulder coverage? done with some sophisticated image. She also looks younger. Today is another day; yesterday is gone. The Queen looks happy and duty bound. Her outfit is close to what she wore for M&H's wedding. The video is even better. It was good to see Meghan waited to be seated after the Queen did. Once again although she is covered,some people may not like the cut of the topping. Look forward to read comments this evening. The fact that many still want to talk about shoulder coverage makes it look like you are all focusing on that, I think people need to let Meghan be. Not necessarily. The comments on the last appearance were exhausted on the open shoulder. When the opposite happens at the next appearance, speaking for myself, I take the liberty to comment. I reacted the way I found today, including the contrast ( yes the truth!) from June 9th. Reactions can not be controlled by others except unless it is a rude remark. Peace! I agree Anon12:21, about Meghan's coverage of shoulders? She chose to wear that outfit June 9th, it does not mean she was gonna wear bare shoulders today. What if she decided on these outfits weeks ago. Yes Becca I agree, Lol! That's what I meant to say. I reckon these outfits have to be discussed with aides and made well in advance, especially an outfit to be worn on the first outing with the Queen after she got married. Becca, that would be a fascinating documentary to watch because this "Wardrobe Department" is a big deal in the royal family. "Just the organization & storage for all those dresses, pants, tops, sweaters, jackets, coats, shoes, hats, purses, jewelry etc..... they must even have a "Look Book", that shows each possible garment put together in different ways with accessories so that they can pick & choose what to wear or re-wear for any given occasion!" It's like a period drama or movie except this is real life, Lol! I can only imagine! Becca, I would watch that documentary. It would fascinating to see the process. Agreed! Also, is that not the same broach she wore to the wedding? The one that fits inside the tiara Meghan wore? If so, what a sweet touch! Rachael, K. ????? If the Queen wore a brooch to the wedding, that fits inside the tiara that Meghan wore, how as it, that the detachable brooch was in the tiara? It couldn't be in two places at once. It strikes a lovely tonal message & also honors the Grenfell Tower Victims! That tiara has many interchangeable brooches, not just one. And the video pointed out that the Queen's green hat and coat also were in recognition of the Grenfell Tower disaster exactly one year ago. That's a lovely and thoughtful memorial color. I think Meghan looks beautiful and nervous. I feel nervous even I am not there Lol!-I love my Duchess and I wish her success.Go Meghan! Her Majesty has the most delightful smile for sure Becca, ok let me go back and look at more pics of the Queen and the Duchess! I really like this dress but I wish there had been a little pop of color somewhere in the outfit. I know she loves neutrals but it's spring! I do love the warm happy body language between HM and Meghan. It's rare to see HM with a big bright excited smile. Love their budding relationship. My guess is that the queen needs to stand out, not Meghan. That being said, she is a big fan of neutrals! bluhare, I am always puzzled when people comment that the Queen needs to stand out. Her Majesty always stands out no matter what. She always wears a hat usually with flowers, feathers or some embellishment, she always wears very bright colours (except for memorial or funeral ceremonies) she is always the one with the most spectacular jewels and she is always the one walking ahead, sitting in the most prominent spot, being greeted first etc. There is nothing anyone else in any group could do to upstage the Queen. So I doubt anyone dresses low key, just to let the Queen stand out. The queen always wears bright colors so people can see her. She's quite small in real life I am told. 🌸 bluhare. 😊 Did you see your church in any of the photos/videos? Duchess and the Queen, I like seeing them together, I didn't know how much it would make me happy to see them together but am very excited. I think they seem to get along! I love the dress on Meghan myself. And have no problem with the likely cost. This is an important event for Meghan--her first solo event with the Queen. I do have a problem with the $450 price of the logo belt, a belt she'll probably rarely, if ever, wear again. Unnecessarily pricey one-time-use accessories are where I think the younger royals seem especially tone-deaf re: costs. One can buy a luxury-level thin black belt for 1/5 the cost of this one and a perfectly nice one for much less than that. In other words, the choice isn't between this one and a tacky poorly made faux leather one from a chain store! The belt is black though so I imagine she will have many uses for it in the future. Also I don't know how pricing for clothing goes but I read somewhere that although they are not allowed to accept freebie, they do get a hefty discount on clothing and accessories. And since she wore pretty much all givenchy today, I don't think she paid retail price for any of it. *Please someone chime in if you have more info regarding prices thanks. You could be right Anon 14:01. Maybe Givenchy included the belt in a "package deal" in a way it wasn't a forbidden freebie. But I doubt Meghan would wear a belt with the Givenchy logo with an outfit by a different well-known designer any more than Kate would wear her Chanel logo belt with an outfit designed by anyone but Chanel. So those kinds of belts strike me as being unnecessarily frivolous. Exactly, Anon 14:01.I'm also curious as to whether fashion houses who dress the royals can discount the retail prices and/or claim the cost difference as advertising for tax purposes. As for the belt itself, perhaps she will wear it time and again as Michelle Obama did with one in her wardrobe. As for the rest, who knows? It's hard to make a reliable judgment about the number of times Meghan will wear it on the first outing. It may even be an "old" item she purchased previously. Precisely because I am ignorant of the facts I have no problem with what Meghan pays for an item. As I understand it, her wardrobe is paid for by Prince Charles and not the taxpayer. If there are any complaints, he is the one to make them not I. What if she wears it again for a private outing? Do only public appearances offset the cost of an item? What if she paid for it herself, before she was officially a Duchess? It’s so early for nitpicking about the cost of minor accessories. At this stage, we really have no way of knowing what has been paid for by the Duchy vs. what Meghan owned and/or paid for herself. Let’s not forget that she is a multimillionaire in her own right. Joanna, I agree with your statement that it's too early for nitpicking. She's less than one month into her life and work as a duchess... a whole new phase. Let's let things unfold and enjoy watching these early days. Later we'll have the benefit of hindsight. As for her touching her hair... maybe it's occasionally due to nerves, but I have long hair and when it's not held back or up, I sometimes need to tuck it behind my ear or brush it back from my face. That's a normal aspect of having long hair and wearing it down, especially when you're outdoors and/or moving around. The 2 ladies seem to really enjoy each other's company in these pictures. The Queen looks animated! What a joy to watch! I want to like this dress, really. I like the fitted silhouette and the fact that it’s very simple, very true to what Meghan seems to prefer (not fussy.) Yet, that pseudo cape/bandage top detail is keeping me from loving it. She looks constricted, almost. The wind today (from these early pics anyway) is doing unfortunate things to her hair, so it may have been a great day for an updo, just to keep it from being thrashed about in the wind. But, she looks very pretty, as always. The DofS and the Queen appear to be having a great time. I rather like the dress but wouldn't wear something like it. The thought of my upper arms being restricted... it doesn't seem that it would be enjoyable. This dress is a rare miss for me - maybe it will grow on me but it makes her shoulders look so blocky! It’s lovely to see them together though. The Queen looks like she's having a lovely time. Meghan looks like she's nervous, trying hard to not put a foot wrong, and also like she's enjoying it too. Exactly how things should be! I'm loving Meghan's outfit. Elegant and a bit edgy, restrained colours allowing HM to be the centre of attention. It's great to see them working this event together. You put it just right, Andrea. She looks like she's enjoying it and wants to be warm and personable, but also nervous about putting a foot wrong. I would be, too! I love the dress too! Very elegant and chic. I assume the belt was put together with the dress by the designer and was not a separate purchase. It is a very versatile classic belt. I love Meghan's dress and I absolutely adore the Queen's outfit. I believe that Meghan is sticking to her aesthetic, which I applaud. I must admit that I'm astounded at the criticism being directed at her over the Trooping outfit! While I personally would not have chosen an off the shoulder dress, simply because I don't like them and I think sleeves and covered shoulders are more formal, Meghan looked fine! The way some have commented you would have thought Meghan was half dressed! This woman cannot catch a break! I feel like people want to see her fail in this role. This is why this day out with the Queen is so important! It shows that she has the full support of Her Majesty! Yes, yes SDR thanks for saying this better that I can!! I think that people are critical of Meghan at times because they want her to succeed, not because they want her fail. You only criticize people whom you know can do better. If Meghan were consistently a bad dresser, no one would say anything. 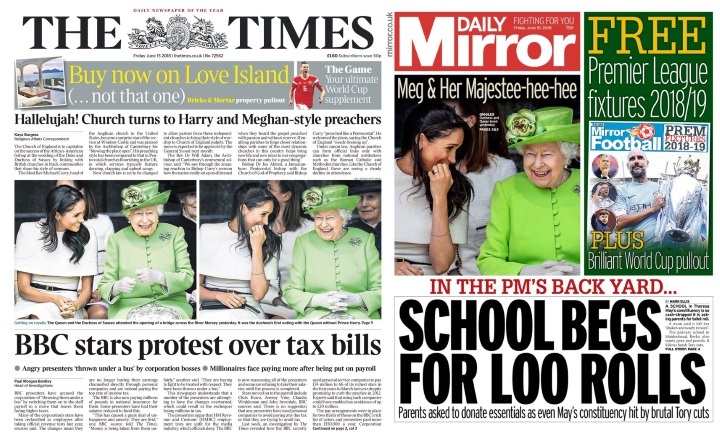 Love the fact HM is wearing green in a nod to the first anniversary of the Grenfell fire. Wish someone could have given Meghan the weather forecast for the north of England .She could have worn her hair in an updo, so that she wasn't constantly battling with it to keep it out of her face. I do love dress. Looking forward to seeing more photos later on. OMG. Loved, loved, the dress as soon as I saw it. Absolutely elegant. So stylish. Love it. You did several times, Lol! I love this look, our Duchess is beautiful and looks sophisticated! For a minute there, I thought Meghan was wearing another off-the-shoulder number...but this - I like! Nice to see her continuing to wear Givenchy items & the cream colour of the dress is lovely & neutral. Paired with the black pumps & belt, it’s simplicity at its best, & that’s what Meghan does so well. Both her & HM look cheerful & relaxed in each other’s company. I can’t wait to see H&M when they do their combined Down Under & Pacific tour. As part of my family has origins in Fiji, I’ll be very interested to see which places they visit & hopefully I’ll get a chance to see them in the flesh here in NZ. 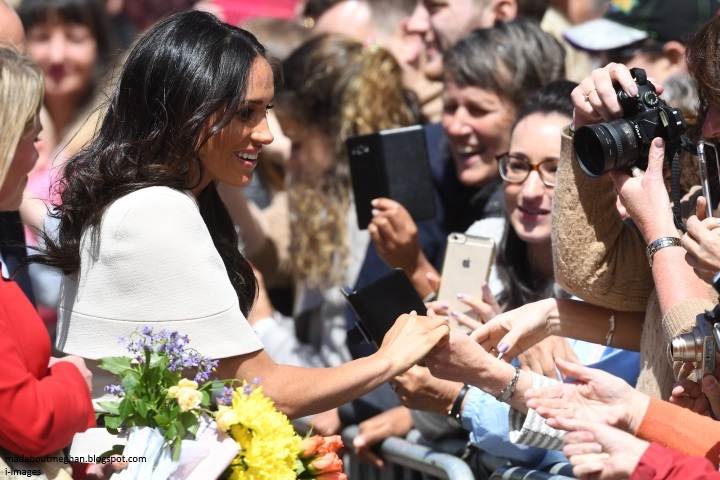 Kiwi Girl, When the Fijian born corporal drove Meghan and Doria, the Down Under Pacific tour had not even been announced…other than a vague report, that Harry and Meghan would be going to Australia for the Invictus Games. So it is highly unlikely that the topic of Fiji even came up. Also, do the drivers actually get to engage in chat with their important passengers? Kava? Hahaha, kiwi Gal! I should hope not! Isn't it produced by the chewing and spitting out of the Kava root into a common bowl? Then allowing it to ferment? I think I saw this on a PBS travel show. Maybe I have my roots confused. I think Phillip would have been game and probably did take part in his salad years while on his South Pacific/world cruise--but Harry? Oooh, I love it! I feel like this is a completely Meghan look. It’s got the classic, elegant lines in a neutral color but with the cape top, the dress has a fun twist that keeps it from being boring. Fun to see both of them together. Not my personal style with the cape part, but she looks lovely, appropriate, and happy. I even think she looks a little nervous, especially when coming off the train, and I give her kudos. I would be a mess doing a high profile event like this with my in-laws, without my husband, and when your in-law is the Queen! I find it a bit endearing. Her style has become more royal.. the garden party and this engagement-- I think she nailed it. I can't wait until the DoC and the DoS do separate engagements on the same day and I have to flip back and forth between the two blogs, and yes I know this has already happened once!! This is my first stop of Meghan and Catherine news!!! Both royal ladies look gorgeous.It's a very important day for Meghan,new Duchess who seems loving the royal job. Meghan is graceful,warm and sweet.She has a strong sense of fashion. I agree w/ your comments Eugenie and I also noticed the hair issue. The same issue w/ Catherine. Constantly playing with the hair because it gets in the way (and also it's likely something to do with their hands). But the two always look so pretty despite that little annoyance. Meghan looks Beautiful! I love her dress - it is simple and chic. I love her accessories. But most of all I loved seeing her and the Queen together! I think the dress is perfecly Meghan's style. I love it in colour and shape as I appreciate neutrals and elegant cut muself. Maybe she'd just have not loose hair, in such a windy day, to be more confortable. For the rest she looks lovely and HM seems at ease with her. Yes! I think it is an LK Bennet suit, right? This is still an all time Kate favorite of mine. She never looked better imo. Thank you for the link, Amy! Meghan looks beautiful today, as always. The dress is perfect attire for a working day and lunch. The fabric is beautiful and cream color a very good choice over white. I think Meghan will stick to her neutral tones. Less is more eliminates error. I venture to say that the cape may be removable. If so, I am sure we will see this dress again as a sleeveless. I love that she has chosen the designer of her wedding gown. I am sure moving into the future we will see many designs by the House of Givenchy. In consideration of the announced upcoming tour appropriate attire is probably already under consideration. Going in a different direction, I am sure the fact that she is not wearing a hat will come into question among the many opinions offered. What I think has to be remembered is that it may be our expectation of what the RF is expected to look like rather then the actual fact. Traveling with HM is as big as it gets. If Meghan is not wearing a hat it was most definitely an option given to her. Meghan choose what was most comfortable for her as I believe she will continue to do when choices are available rather then what may have been done before. That is what we love about her! Meghan and HM seem to be getting on very well and both appear to be very comfortable with each other. HM looks fabulous as always. I too was wondering if the cape is removable. If so, the classic lines of the dress will have many options for her. I agree with you other observations also. In one of the pictures, a short sleeve is visible under the capelet. I'm sure the cape is removable, and we'll probably see the dress alone at some point. The women attending seem to be one of the Queen's ladies in waiting, Harry's assistant secretary who has been loaned to Meghan for months, and probably the Queen's assistant, also on loan to her. Has it been announced who will become Meghan's secretary. I love how genuinely happy and pleased HM looks today. She just looks simply lovely! 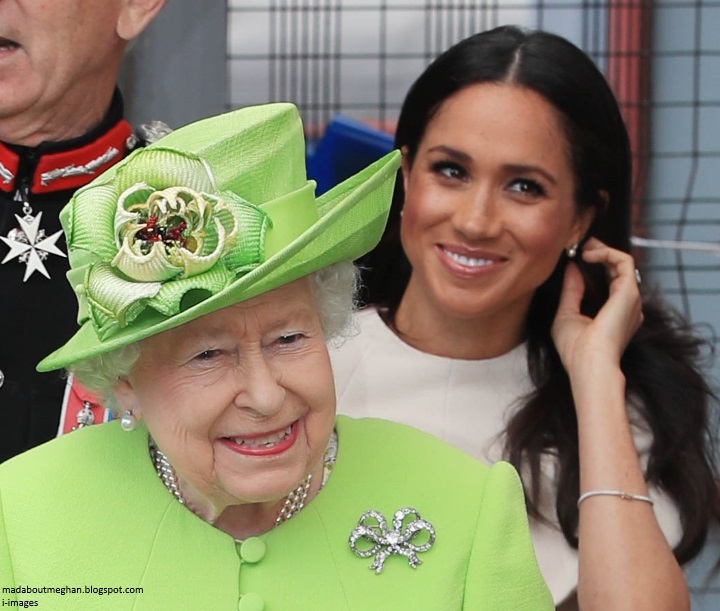 The smiles between the Queen and Meghan show they have a great rapport. The Royal Reporters are saying the earrings are from HM! What a lovely touch! What a fun post! Queen Elizabeth looks so happy, I love the pictures of her. She certainly appeared to be putting Meghan at ease on their first venture together. Meghan looked so lovely. The wind didn’t do anyone any favors, so perhaps an updo might have been the better choice. But, it was a terrific series of events. I agree, Tedi! I was so happy to see the Queen smiling in many of the pictures. It looks like she enjoyed having Meghan with her and helping her to take part in everything. Meghan was visibly nervous, especially at the station, which does her a credit in my eyes 🙂. They seemed to be joking and really at ease while watching the performance, HM looked so lively and young. I'm sure Harry at home was nervous too but also proud of his wife and very happy she and "Granny" seem to get along pretty well. It looks very windy today and that's why she keeps touching her hair I guess. Or it's a nervous habit. I don't think she brought along a personal hair stylist today and that's why her hair looks very simple (no curls or waves). And also maybe why she didn't put it up. She could hardly do her usual messy bun when she's out with the queen. Wow Meghan really hit a homer in today!!! What a beautiful dress!! Wow is all I can say, she looks every inch a Duchess so regal and cutting edge on the fashion!!! I disagree on the hat issue, the venues seemed too informal for a hat, outdoors with children, a hat would looked too stuffed up for someone Meghan’s age in this particular setting, the Queen however, looked wonderful we expect her to wear one, it is sort of a staple anytime she is outdoors in daytime public. Meghan looked incredible, the only improvement I would suggest is that because of her hair being thicker or more course, she needs to experiment and find a really nice style where it stays out of her face. I believe the wind and humidity does a number on her hair. I think a nice pull back ponytail would’ve been very beautiful for today’s occasion. Indigoisle, agreed that a low ponytail would have been nice but my guess is because the cape portion on the top of her dress would give her a somewhat broad shoulder, she probably wanted to balance that aspect and her hair did just that. I have long hair and that's my guess. I am not a big fan of this dress , not more than of the one for Trooping the plouf, but it is a personnal taste, and I am very happy to see Meghan sticking to her tastes , modern and classy , timeless and therefore elegant at any moment . I can’t help thinking the cape restrains her shoulders’ just as if she wanted to be reminded of restraining herself in order to behave protocol wise .... 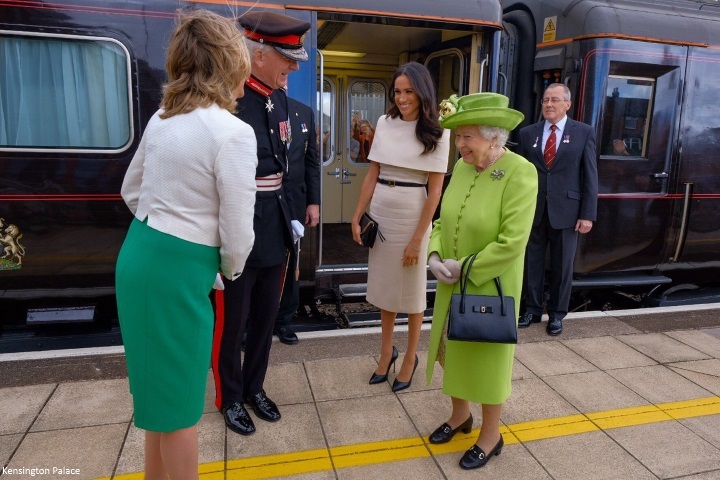 I wish I had been a little mouse on board of’ the royal train , to see and hear what they did during the evening before going to bed and during breakfast ..... certainly the Queen had Meghan talk about herself , and also answer to a lot’ of questions from the new Duchess ! This day with the Queen and without Harry’s support shows clearly how strong and self confident Meghan is , she knows how to behave in public and how to speak to strangers, she is clever and has a lot to give to the persons she meets, the rest is’ just adjustments to the BRF , good will does a lot ! Sorry for’the Bad typing, did not mean to be rude , just wanted to write Trooping the colours , of course ! I forgot to check what the automatic correction ... did not correct ! Sorry again . I have a mortal fear of mice, but always say if they can talk to me a la Stuart Little, they can stay. We can just be those types of mice-little but with perfect manners. Lol Katie, agreed :) Perfect-mannered, refined little mice! Wanted to make one more comment, did anyone notice in the first video where Meghan started to cross her legs then quickly undid them? I just love her- she is trying so hard to to get things right, I think she is just a doll and how lucky Harry must feel, I am sure he thinks she is just an angel to give up her her whole existence and completely give herself to him, his family and the British people, I am sure that it will take a while for her to form new habits like not crossing her legs, I think she is doing a surpurb job!! So happy to see this! Meghan looks beautiful and elegant. I love that she's wearing pale colors so she does not upstage the queen in any way. 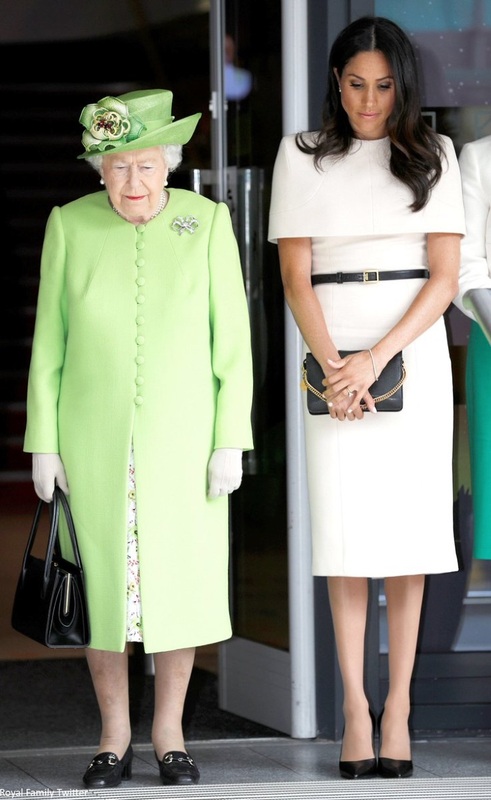 Meghan is so much taller than the queen and needed the right outfit to blend a bit in to the background. This worked. It's a simple style, but elegant, with just a touch of color instead of the tans, browns, and whites we saw when she traveled with Harry during their engagement. She and HM seem to get along well. I don't think Meghan looked too nervous;however, she seemed to pay close attention to HM and make sure she walked behind HM and did not overstep in any way. I did notice that Meghan crossed her legs at the knee, and then quickly corrected herself and crossed at the ankles. I have only one complaint, and it's the hair again. Has Meghan ever heard of barrettes? If she wants to appear poised, constantly touching her hair, either because of nerves or the breeze blowing it in her face, is very distracting. I hope she eventually figures out something that will work for her. But so far, she is doing very well for being so new to the RF. Great job! Christi, I will repeat a comment I made above. I totally don't get comments about not upstaging the Queen. How could anyone upstage Her Majesty? The Queen always wears hats with flowers, feathers or other embellishments. She always wears a bright colour, except for memorial or funeral services. She always has the most spectacular jewels in any group. The Queen walks in front, she is given the most prominent place to sit, the entire event revolves around her. So NOBODY ever upstages the Queen, no matter what that person might wear. Also you speak about Meghan wearing a touch of colour. Huh? Cream dress with black accessories does not register as colour to me. I don’t entirely agree. I am 5 foot. If I am trying to catch a glimpse of someone in a crowd, they are much easier to spot if they are in bright colors and are the only one in bright colors. 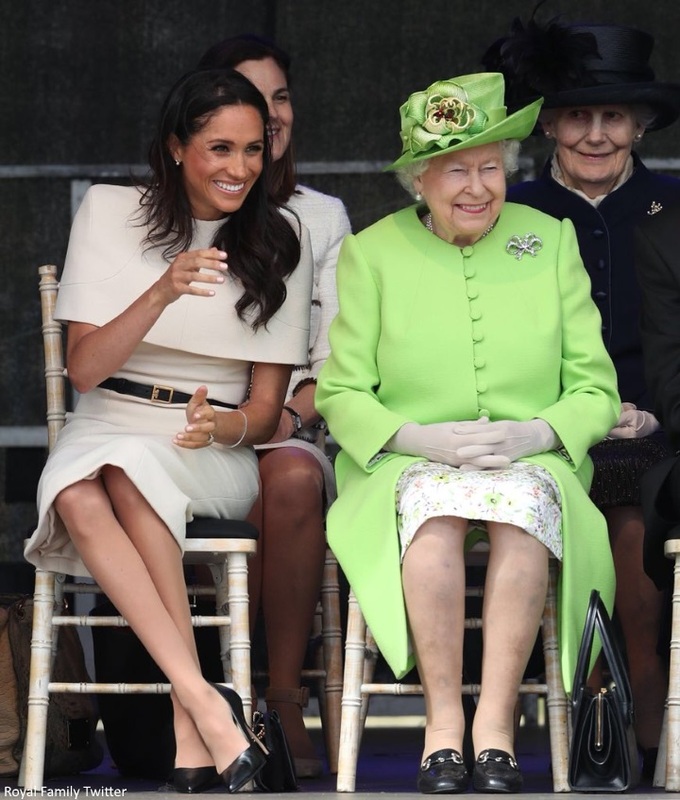 Meghan bent over slightly in a bright color and the Queen in a bright color, from a distance through a crowd, could be confusing. Up close, there would not be any confusion, but for events like this, you need to be visible both up close and from far away. It’s a lot more fun to know for sure you spotted the right person. Silvia, Emily Nash a royal journalist says she was told the earrings are a gift from the Queen to Meghan, how lovely! First, anyone with even a little bit of haute couture insight will notice that the seaming and construction of Meghan’s dress today is very similar to her wedding gown. My guess is this piece was in the making while her wedding gown was being finished. It also appears to be made of the same material, perhaps dyed to the cream hue we see today. The over the shoulders cape is inspired - if you ask me - a very clearly intentional nod to Meghan’s apparent love of the off the shoulder look while remaining appropriately modest when appearing in a solo outing with the Queen. Also noted if one looks closely- it looks very much like she is trying to grow out her shorter side locks of hair - which only grows so fast, folks! I suspect she is transitioning to a ‘down’ hair style lending itself much more easily to updo’s when necessary. Remember also she is in a new climate - to her. She will learn over time what works best in the very unpredictable British weather (she did grow up in LA where the weather really never changes). What impressed me most is the fact that she is wearing a pair of earrings that Kensington has publicly noticed are a direct gift from the Queen and which match the pair the Queen wears pretty much daily. I think it’s an absolutely beautiful gesture on the part of the Queen and one indicating a deep affection and favour. Haven’t noted any other royal women with such accoutrements during such an event. I think Meghan is very obviously working to establish a respectful and yet unique ‘style’ of her own and I think she nailed it today. I agree, although she did live in Toronto for several years, and Los Angeles can be quite breezy most of the year. Sea breezes and Santa Ana winds see to that. If she'd pulled her hair back, the chorus on the side wisps would be just as loud. Lol Becca, I enjoy reading your responses! Anonymous 14.36, Kate also wears this earring with a small diamond and larger pearl, so perhaps the Queen gifted both Duchesses with these earrings. No bare shoulders today, nor will there be again in daytime appearances with the Queen, I suspect. If I did not assume that this dress was made months ago, I would say Meg was making a statement to those who found her shoulder-baring inappropriate--"You want covered shoulders? I'll show you covered shoulders." 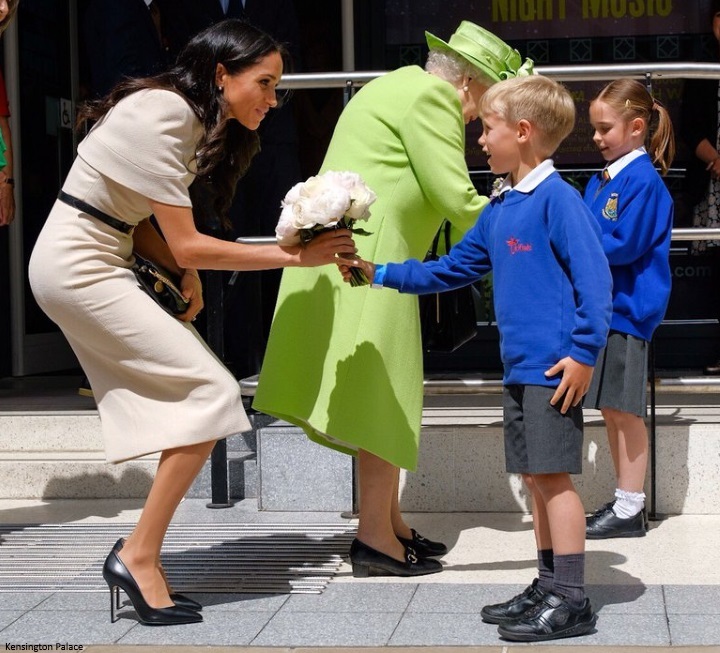 After seeing HM's amused reaction to the children's show today, I wonder if HM also finds a little amusement in Meghan's sticking it to the royal protocol experts. How many times must the Queen have longed to throw off the royal trappings and putter about in Wellies , Burberry, and Hermes scarf? I especially enjoyed the side-eye and barely controlled facial expressions the Queen's LIW was giving Meg and HM. Almost like a prim and proper Head Mistress looking upon two giggling school girls. That's what that shot reminded me of. I think Meghan encourages HM to feel young again. Kate frequently wears a similar pair of earrings from the Queen. Laura, Kate does and I did read somewhere that they are from the Queen. Sophie has a pair too and HM gave a larger pair to Diana when she was first married. 🌸 meghanfan. 😊 The Queen’s have little diamonds at the top like the ones she gifted to Meghan. I adore how in the videos she tries to engage with the Queen. Converse. Smile. Laugh. She seems to really be trying to “win her over” so to speak and I commend her for that. I’d be a wreck just bubbling over inside with nervousness! She may be nervous but she doesn’t show it much :) Keep on keepin on Meghan! Courtney, I think she likes to talk to people, and it is lovely to see she does it more than other royals do .... besides, I think the Queen is quite a talker, she often bends to say things to those next to her , she notices a lot of details , sometimes like a good housewife making sure everything is fine , I,love to see her doing that ! I love the dress. I hate when a good dress wrinkles though, I've had similar problems with a few of my own dresses and it makes me not like wearing them. I feel a sleek ponytail would have been nice since it was so windy. Otherwise she looked great. Meghan looks lovely. Her dress is elegant, comfortable looking, good neutral color. I don't much care for the style but it's entirely a personal choice as I think the DofS looks fantastic. I didn't even notice she wasn't wearing a hat until I read some of the comments here. I'm sure if a hat was required she would have had one, but as we Americans rarely wear a hat, it wouldn't necessarily be in her comfort zone. I think she looks great in a hat so maybe she'll become more comfortable with the idea in time. One thing she needs to be mindful of is the hand to the face. I know it's just nerves, I used to do the same thing and I didn't have the pressure of cameras in my face or traveling with a queen! This dress is gorgeous - elegant and chic...perfect!!! Meghan and the Queen look very happy and relaxed together. Love the whole look! Our Duchess nailed it!!! She reminds me of Princess Charlene of Monaco in her taste. May we see more continental couture from Meghan? Don't know. What a nice day for her and HM. I could definitely see this being repeated sans cape. Or if she wanted to wear the cape again, she could wear her hair up and do a striking brooch a la HM. Is it me or does her hair seem shorter than in her engagement photos? I personally do not like capes, but that is what I wear and don't wear. I love that she incorporates her personal preferences into classic styling. I think the cream against her black hair, black belt an purse, and black shoes is stunning. I love her loose hair---it is very youthful and says "I am definitely the junior member here." The earrings as a gift are incredibly sweet---they both look happy and delighted to be with each other. Perfect. Well done, brand new duchess! I just noticed...I think she wore her belt upside down! @Penny- I wear belts with the "tail" going to the left. I am right handed. Meghan appears to be wearing this one with the tail going to the right. That's opposite from the product shot but I suspect Meghan wore it that way because she is left-handed. Any lefties out there know for sure if that's typical for a lefty? I think most belts including this one are designed to be worn either way. lizzie - true, a belt can be worn any way, but in this case it means the logo is upside down. It's really not a big deal, I just thought it was kind of funny. lizzie--I'm a lefty, too, and I would wear a belt with the 'tail' going to the right. Let's face it, the world is against lefties--so I feel compelled to defend Meghan on this one! Love the dress and whole look, shoes, belt, purse and earrings. Meghan looked beautiful and she and the HM looked like they were having a lovely time together. Love her look and the easy way she has meeting people and interacting with HM. I wonder what they discussed on their overnight trip? Catching up on the honeymoon? And lovely that they breakfasted together before getting ready for their long day. 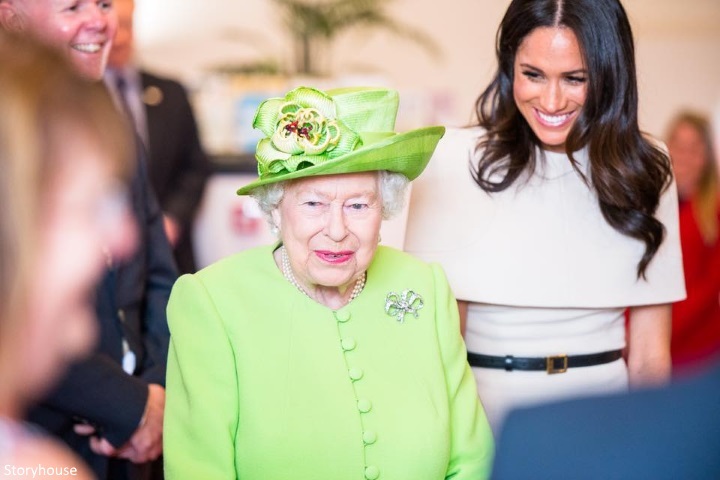 I noticed HM’s earrings appear to be identical to those she gifted Meghan. A thoughtful, grandmotherly gift. The very best thing is seeing the Queen smile and laugh like she's got a winner at Royal Ascot. She seems to be delighted with her new granddaughter-in-law. Meghan's look today is a winner for sure. Chic, sophisticated, elegant, suits her perfectly. Hair loose works better despite the breezes. A modern backdrop to the Queen's reliable perfection. I suspect when Charles comes to the throne, the Royal ladies might scale back on hats. In the event, none was required today. If Clare Waight Keller is going to be Meghan's Sarah Burton, I'm going to be very excited. She looks stunning. Love this simple elegant look and the cape gives it that “edge”. I have to say it’s considerably windy up north at the minute ( thanks to storm Hector) so I think a hat would have been too much of a worry to look after, and an up do too at risk of blowing out. The hair down looks lovely and softens the couture lines around the dress. Love the earrings are a gift from HM - definitely a seal of approval in lots of ways. Judging by some of the videos online - the slight discussion about who should get in the car first - thought were some lovely moments ( rather than any faux pas) it showed to me that Meghan is very attentive and although a tad nervous, gosh who wouldn’t be, there’s a natural warm relationship building with the two. Look forward to seeing more. MM asks for and takes direction in a very matter-of-fact way, which is probably why she worked well on Suits. so appropriate, so stunningly simple and elegant. And stylishly modest yet certainly in absolutely no way prudish or “Victorian”. This is SPECIAL. ANOTHER first. They are identical almost to the Queen’s. 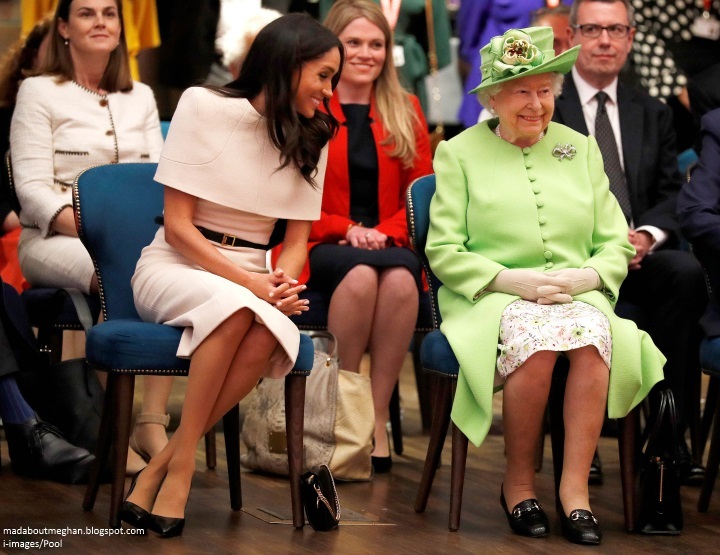 The ease of the Queen in interactions with Meghan, the rapport, laughter and fun. PHENOMENAL. I have NEVER seen that on that level before. Not even close. SO cool to see the Queen having fun like that. After 60+ years it is about time, yeh? The people of Chester were blessed and a blessing. Beautiful bridge. So very needed. I will see if they scanned the area and if bluhare’s Church made it’s Royal debut. What was on the menu for lunch? Anyone know? Agree with it all, SG! Matching earrings, but smaller for MM because she likes small. Incredible. The Menu is now given on the post---making me very very hungry. Also, for Surfer Girl, here is a list of all the balcony occupants! Seems like every Windsor in the country turned up. Yep. Lots of Windsors. I wonder what the weight load of the balcony is, lol. That is a concern!! Gee, now I hope the next balcony scene is down to 5, I mean, 6. Beyond that I think she appears NOT to have put a foot wrong, her "lack of a hat" is PERFECTLY acceptable and I think would have looked a bit too "uppity" on the Duchess for the occassion. The dress and the style is spot on perfect for her- respectful, fresh and a lovely design overall. Had a feeling she would continue to wear Givenchy. Possibly she and the designer are working to develop a signature look for Meghan? Perhaps Keller and McCartney will be the go-to designers identified with Meghan as McQueen is with Kate for major events. I think Meghan’s look today was perfection. I love how she managed to be covered from neck to shoulders in a totally stylish way. And how lovely that she was wearing earrings gifted by the queen. What a perfectly royal accessory! I like to think that the queen recognized Meghan’s perferred style of earring and chose her gift accordingly. I think Meghan’s look was perfection today. Love how she is totally covered from neck to shoulders in a totally elegant and stylish way. Just brilliant! And how lovely that she is wearing pearl earrings gifted by the Queen. I like to think that Her Majesty noted Meghan’s preferred style of earring, studs, and chose accordingly. 🌸 As Charlotte noted, Kensington Palace was lit green as a remembrance and the Queen wore green as a remembrance. Noted also by Charlotte, the Queen was quick to go to comfort victims and Meghan visited victims on her own time also. I am sure the Queen didn’t miss that fact. I am personally not a big fan of the cap, but the DOS looks lovely. Just curious... Are HM and the DOS both traveling back by train too? It would be so cool to have a bit of a fashion update on HM along with Meghan's. I think she's earned a mention. 🌸 I hope Meghan wears those earrings OFTEN. The Queen wears those almost all the time so they are uber special to her. That is such a very profound gesture of affection by the Queen. I am sure that the Queen very much misses her mum and her sister. She was with both of them everyday almost for most of her life. It seems that Meghan (and Guy❤️🐾) are filling that gap a little. Very Sweet. I love Meghan's look today. I feel that it is so "her". I feel it is completely chic, very modern and totally Meghan. Reminds me a little bit of her Stella McCarthy cape dress. I look forward to seeing this again with a hat - and hair up - for perhaps a somber church service - or something along those lines when a repeat works well. 😍﻿If Meghan wore a brand-new outfit, Her Majesty recycled the outfit she wore to the 70th anniversary of the D-Day landings back in 2014 and at the Royal Ascot in 2017. My comments haven't come through on the last few posts and I'm not sure why, but hopefully this works! I absolutely love that the earrings are a gift from the Queen and that the Queen, herself, is said to have a matching pair! What a great experience for Meghan for her first solo engagement. I'm sure the Queen has been most helpful in prepping her for the work. I also love seeing the smiles between the Queen and Meghan. They seem to have a warm relationship that I hope continues to grow. Meghan did seem nervous, although I don't blame her in the least. It must be hard for her wanting to be warm and show her personality while also not making a mistake or frustrating the Queen. In the videos, you could see how Meghan wanted to chat and be open, but also didn't seem 100% sure if it was ok, which explains the fidgeting, I think. She looked absolutely gorgeous, though. Meghan hit the nail on the head with this look today. It's the perfect mixture of her minimalist, edgy style and royal protocol. 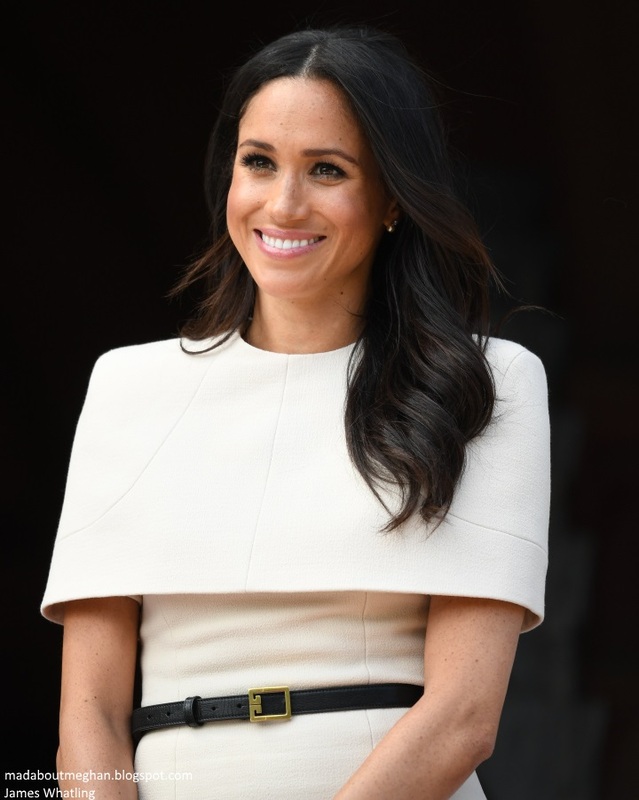 It's very similar to the outfits she wore on Suits -- it fits her body well, is a great neutral color that works well with her skin, and is appropriate for the occasion. I'm not usually a cape fan, but I like the look of this and Meghan wears it well. The black belt and pumps are re-wearable items I'm sure we'll see her repeat in the future. Excellent, another and different shoulder emphasis! May I gush a bit, such elegant style in a pleasing neutral, and how cool to accessorise with black shoes, bag, belt as the Queen has done. Thank you to the commenter who suggested the Queen's hat = crown, makes sense! A hat on Meghan for this day's engagements would be redundant. Great post, lots of positives. Intrigued with what craft work the Syrian group is doing, must research. 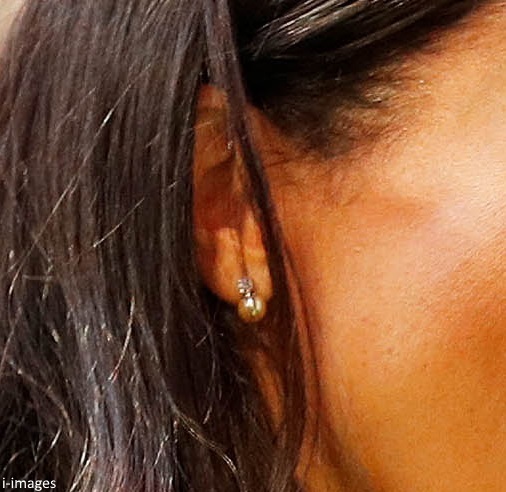 Does anyone have any thoughts on the colour or shade of the pearls in Meghan’s earrings? I’m seeing almost a golden colour or a very deep cream with a yellow tinge. Not sure how much the light is affecting what we see, but pretty sure they are not the usual white or cream shade. Oh Meghan, you are really winning me over as a Duchess! So well done today! Gahhhhh And now I must find a cape of my very own, thank you! The Dutchess looked beautiful, I thought! And her interactions with the Queen seemed so natural -- asking when she didn't know the right thing to do, or the Queen gently directing her. I love seeing how much they enjoy each other's company! It's very clear that the Queen likes her a great deal. She wants her grandson to be happy, obviously, and since he married an American who isn't familiar with royal protocol, she's helping her. I'm just very happy that everyone seems to be happy to help Meghan out to really get her up to speed and put her to work, like she said she wanted! And she looked true to her style while remaining fairly inconspicuous. The cape dress is lovely, and the earrings are another example of the Queen's thoughtfulness and welcome to the family. It looks like they had a nearly perfect day together! Charlotte, your presentations are just perfect! As are your summations of MM's looks. Thank you. And I would love to see MM in that gown! 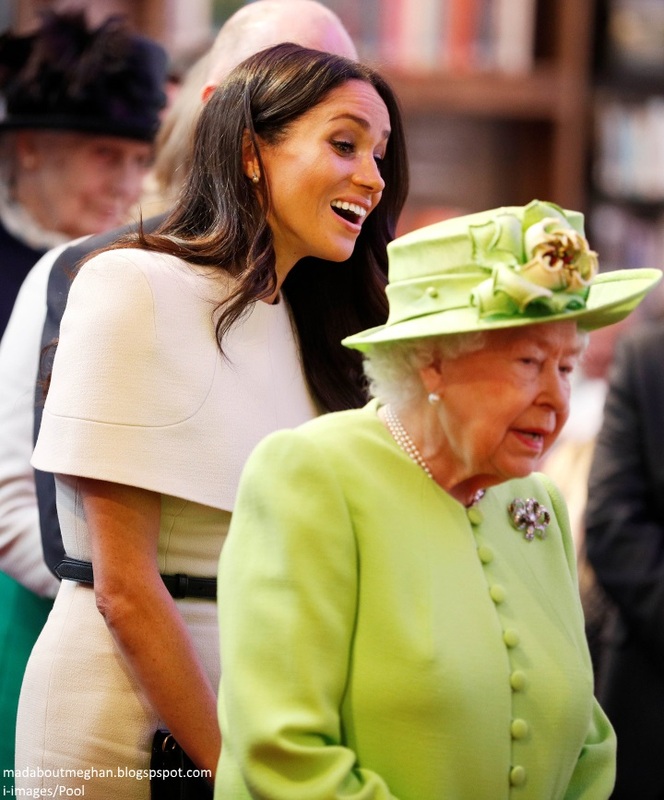 The Queen looked lovely in her green coat and hat ... but I do not like the top of Meghan's dress at all. It looks like someone started to wrap her like a mummy and got interrupted! The color and accessories were super but I just didn't like it from the waist up. But a lovely start for future solo events. Thank you also for sharing the information on the train, I had to smile about the comment regarding speed and no bumps during bath time. This was a very enjoyable post! I didn't know the Queen had a train! It was really fun to see the pictures and read about it! 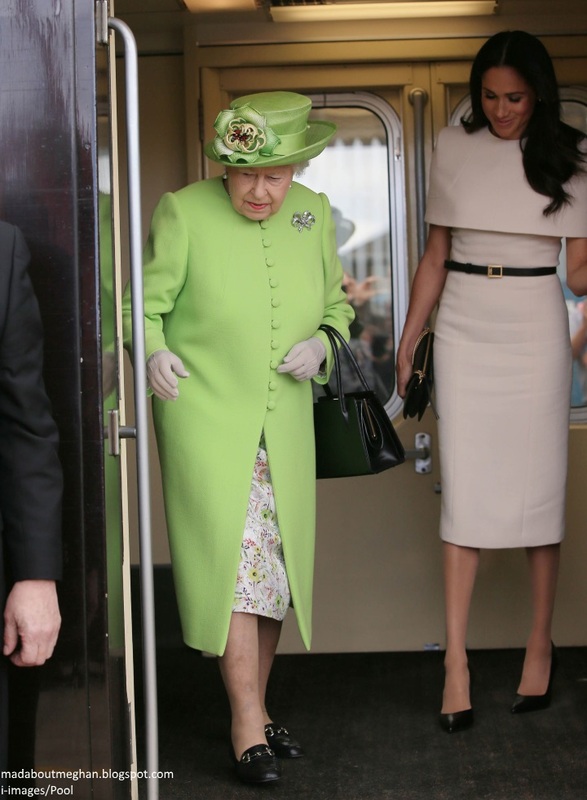 The Queen looked amazing in that green color. I especially liked her hat with the beautiful flower. The Duchess looked wonderful as well, and I can't imagine having to work with the Queen and learning things on the fly (like who enters the car first haha). Looks like they both enjoyed working together. About her hair being down. Is it possible that since she went by train she didn’t take a hair dresser along. If she did her own hair, down may be how she can fix it the easiest. Loved MM's outfit today, so stylish yet perfectly minimalist. I wonder if the cape can be removed, it looks like the dress does have short sleeves in which case it would be perfect for many occasions. I love that MM has "found" her style partner with Givenchy and Claire Waight Keller. I think this perfectly translates MM's slightly edgy self into a more "demure" (in a good way) presentation while remaining the essence of who she is. I think the Duchess' look today is perfect from head to toe. I'm sorry that there was any discussion of hat/no hat. I have no doubt in my mind that if one was required today by some dress code, she would have worn one. The end. Some were also concerned that her hair was not in an updo. Really? How many times in a more informal setting have you seen the DOC in an updo? Never. I didn't really want to say anything about all of this, but I guess I felt the need. LOL Regardless, I say again. The Duchess' look today was perfect. I think some of us just thought her hair might have fared better in an updo because of the wind. If it hadn’t been windy, I think her hair down would have been fine. It looked great when they first got off the train, but it got messed up once the wind hit it. Weren't they both a polished pair today!! Stunning!! It is delightful the way HM has taken both Kate and Meghan under her wing. Yes the hair was a problem but Meghan will figure these things out on away days. Absolute NO to a hat. I wish she would do more 1/2 up hair as the eve before the wedding? It looks fantastic on her and would probably look more kept in the wind/weather. I know what almost everything is and it is a very refined menu too. Very nice. Sounds yummy. 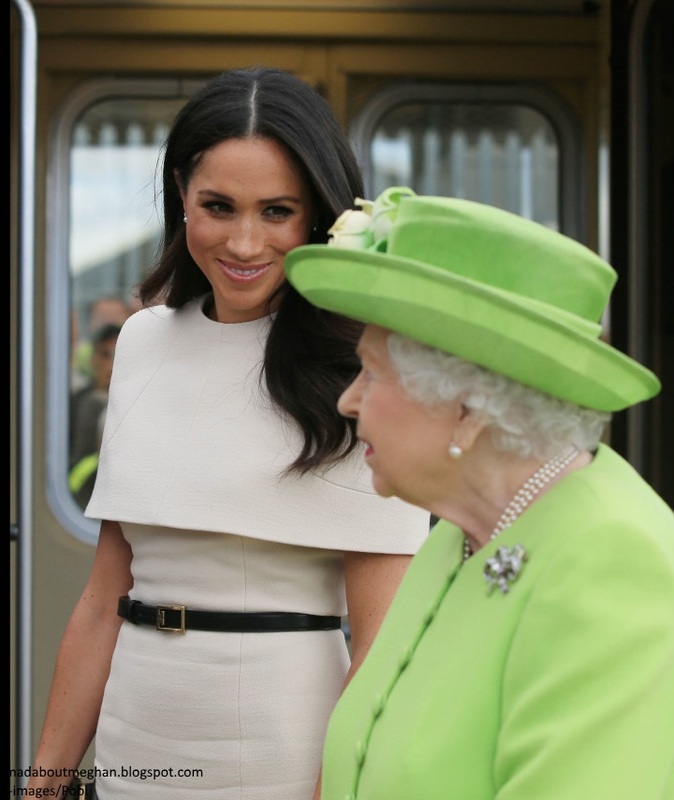 🌸 They said that the Queen and Meghan most likely took off yesterday evening from London aboard the train. The train most likely arrived at Chester before too late that night. They park the train in secret places so the Royals’ sleep is not interrupted. Then they arose, breakfasted and dressed on the train in Chester this morning after having arrived there the night before. Fabulous look on Meghan, polished and so elegant, love it. What pressure she must have felt?! My goodness! Can you imagine?! A slumber party :) and day spent with the Queen of England while the whole world watches your EVERY move! I think she looks absolutely lovely. The Queen seems to have a very warm side as she gently and sweetly coaches Meghan on protocol. I loved it when she engaged Meghan in a conversation where they shared a laugh. I also noticed a moment when Meghan crossed her legs, one over the other, and then quickly uncrossed them. I read somewhere the royals are never to sit with their legs crossed like that? Lots to remember with the world watching... I'm sure Harry is very, very proud of his new bride! Well what a day I was looking forward to and I was served. First of all this trip by train is so extraordinary I would have liked to be a little mouse to see what happened. The style of Meghan once again beautiful so classy and professional class I liked everything about her hair his jewels his shoes and of course his bag. The event today with the Queen seems so unreal Meghan has done well I liked their complicity and all those people came to see them Incredible. Just noticed: one of the engagements was with a group of women from a Syrian settlement. What a lovely gesture of inclusion and religious tolerance that sends a message and tone from HM. No wonder the DailyMail comments seem to be even more vitriolic than normal today. And it's a great way for Meghan to start her work. These engagements were fun but also serious and unpretentious. There was very little ceremonial pomp in today. I also think it's great that HM has grown up but never grown old. At 92, she's still changing the tone of the monarchy and actively making it more inclusive, less tone-deaf, less ivory tower. She did not *have* to do this busy day of fairly low-key engagements. It's great that she did. The Duchess and the Queen look fantastic together! 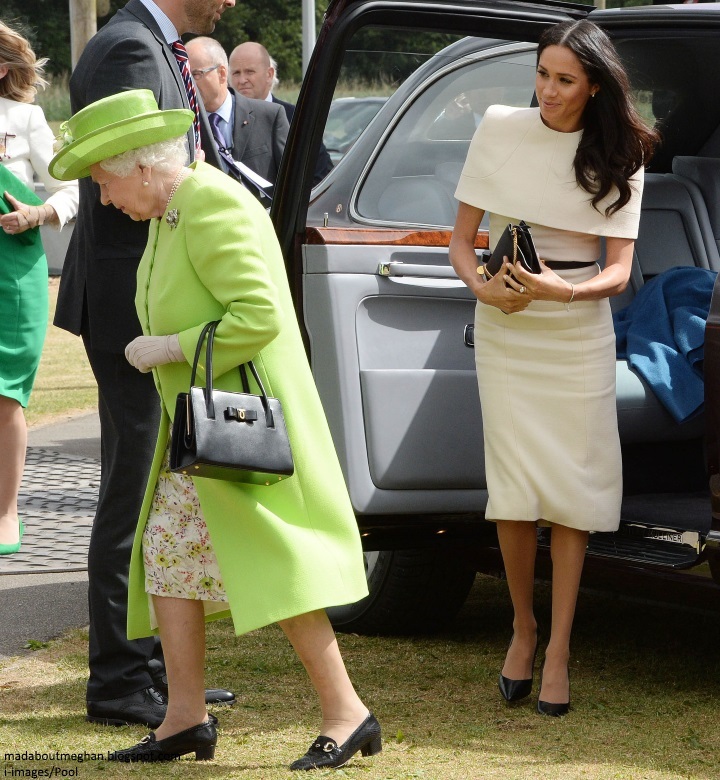 The Queen’s green outfit and Megan’s cream dress compliment each other. I'm not sure, but the Duchess was wearing pantyhose? I love her outfit, she looks great! how jealous am I that she had a ride on the royal train!! the whole day looked like a wonderful time. I don't blame her for being a bit nervous, but it came across as endearing and not uncomfortable in my opinion. Go Meghan! on a side note, I just cant get over how slim her legs are and her ankles!